Organized by food historian Katarzyna Cwiertka in cooperation with the Netherlands Organisation for Scientific Research (NOW), the Garbage Matters Project at the University of Leiden, the Netherlands, hosted the conference Waste in Asia (WiA) from June 9–11, 2016. In a pioneering effort, the conference brought together twenty-nine scholars from anthropology, sociology, economics, literature, art, history and landscape architecture. Economist Masanobu Ishikawa (Kobe University) delivered the keynote speech and stressed the significance of public waste prevention awareness campaigns. Four major issues were explored in nine panels. Firstly, food waste emerged as a pertinent issue. Kohei Watanabe (Teikyo University) noted that “half of kitchen waste is edible”. Several presenters identified waste-creating behaviors such as an obsession with freshness and explored strategies to prevent food waste. Whereas food producers in Japan are encouraged to reduce packaging waste through Extended Producer Responsibility (EPR) policies, several countries in Asia seek to “shape a responsible consumer” through state intervention programs and educational initiatives. A public education media campaign might be a way to tackle food waste in Beijing, as Shuxi Yin (Hefei University) asserted. Won-Chung Kim (Sungkyunkwan University) investigated the implementation of a radio frequency identification disposal system in Korea, whereas Stephanie Assmann (Hokkaido University) examined a governmental No-Foodloss campaign in Japan. Tammara Soma (University of Toronto) questioned accepted notions of gender equality in her paper on unpaid food work, which serves as a pedagogical tool to prevent food waste in Indonesia. Loretta leng Tak Lou (University of Oxford) looked at “greentechnics“ in Hong Kong who “perform” recycling to raise environ- mental awareness and protest against Capitalist consumer practices such as the Yeah Man who eats the leftover food of strangers at McDonald’s. Waste is an economic resource, as Freek Colombijn (Vrije Universiteit Amsterdam) introduced the second major theme. In China, waste collection largely remains the task of non-registered waste collectors despite the implementation of a legislative waste management. In Hong Kong, practices of casually dumping garbage create opportunities for waste scavengers to transfer garbage to assigned collection points. Efforts of elderly local residents and migrants to create a network of waste collectors on Hong Kong’s street markets are countered by governmental attempts to sanitize and regulate public space. In Indonesia, waste collectors reconnect with the formal sector through selling recyclables to waste-processing factories. An entire panel was devoted to informal waste collection in India. Durgesh Solanki (Tata Institute of Social Sciences) argued that intersections of caste and globalization need to be addressed prior to resolving the “crisis of waste” in Mumbai. The hierarchy of caste perpetuates discrimination against scavengers of the Dalit community and reinforces the “reproduc- tion of untouchability”. In this context, Dana Kornberg (University of Michigan) examined how new sources of stigma are negotiated as inter-caste and urban relations continue to impact informal waste work. Waste pickers do not always fall victim to discriminatory practices, but in their efforts to counter stigmatization, waste-pickers claim their “right to waste” through the formation of a trade-union as a form of empowerment, as V. Kalyan Shankar (India China Institute) asserted. The definition and transformation of waste was the third pivotal and recurring issue. In Sri Lanka, the social generation of waste is underestimated, whereas governmental waste classifi- cation schemes in China differ from the perception of citizens who differentiate between sellable and non-sellable goods. Assa Doron (ANU) discussed how bodily artefacts such as human hair in India are discarded and recovered then regain value as “Jewish wigs” in affluent New York. In China’s music market, transnational waste disposal practices resulted in the re-evaluation of discarded records as commodities, while practices of Taiwanese clothes companies to make use of waste materials are supported as societal commitment by governmental policies. Finally, several scholars and artists reflected upon waste in art, film and literature. The rubbish ground Yume no shima (Isle of Dreams) is addressed in Hino Keizō’s novel Tokyo. Artist Kotaro Nagira’s Gikkon-Battan Project presents the weaving of discarded and recycled textiles, while artist Jaffa Lam’s Micro Economy Project showcases new understandings of the modern city. The aetheticization of waste is prevalent in garbage poetry written by A.R. Ammons and Choi Seongho and a significant topic for Korean writers who articulate an ethics of a “life without waste”. Finally, highlighting the films of Brilliante Mendoza, who uses waste to show the dissensitivity to disorder in poverty-stricken areas, Arthur Joseph Vito Cruz (UA&P) discussed the cinematic reflection upon waste in the Philippines. Each session was concluded with questions from the audience that provided for a lively and productive conversation about a pressing topic. The conference was augmented by a documentary film program and an exhibition “Too pretty to throw away: Packaging design from Japan” which is on view in the SieboldHuis in Leiden until August 28, 2016. Stephanie Assmann. 2016. Conference Report: Waste in Asia, University of Leiden, the Netherlands, June 9–11, 2016, Asien. 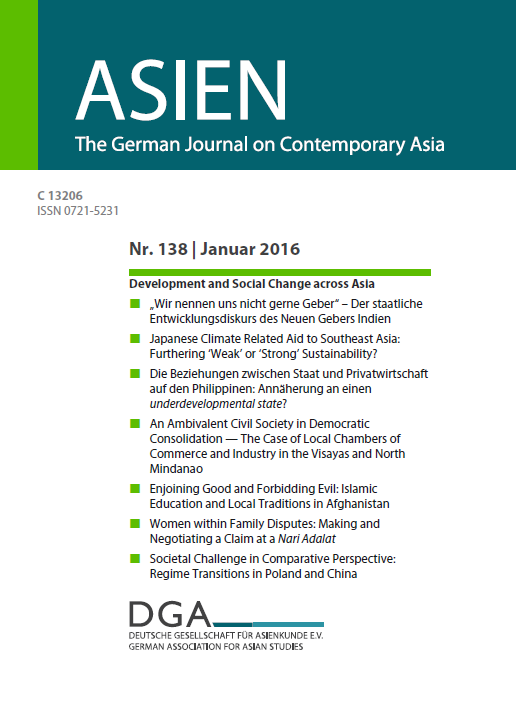 The German Journal on Contemporary Asia, No. 141, October 2016: 90-91.